Voyages around a former ice sheet…..
After a decade of dreaming and years of planning our team of 40 data-hungry geoscientists were given the scent and released from their cages (~desks) with the audacious task of blitzing the whole ice sheet to find samples for dating its retreat. 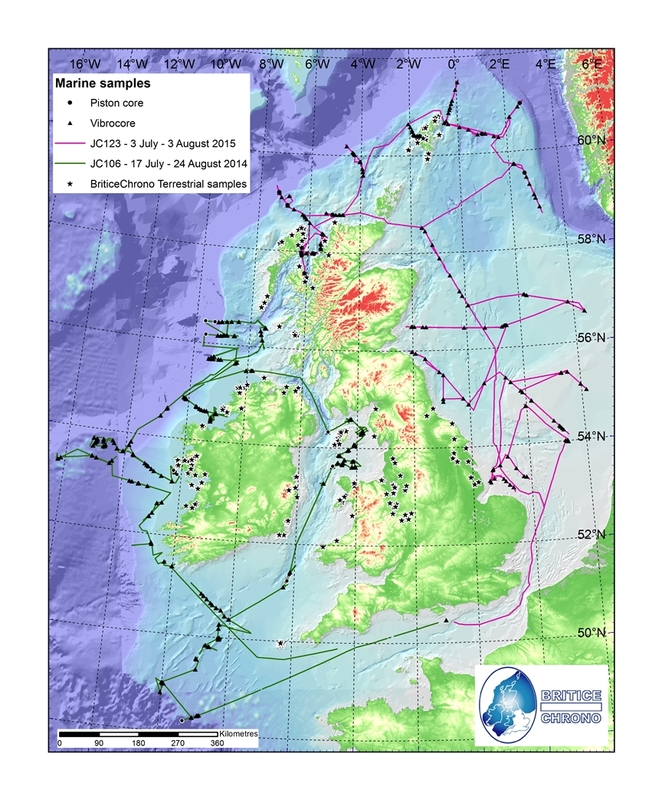 This started in November 2012 in a grey drizzle at Seisdon sand and gravel quarry near Stourport and finished 09:30am 1st August 2015 in bright sunshine when we extracted our last sample, a seafloor core, from the Cleaver Bank in the southern North Sea. It really has been an epic two and half years witnessing the Terrestrial Team with sun-cream in the Scilly Isles to shivers in Shetland, and with dressing gowns in Donegal to JCBs in Norfolk. We really did covered the ground from south to north and east to west and snuck in 28 – yes 28 – different islands of Britain and Ireland, including Scilly Rock and Foula. When samples were not easy to spot and grab, we used radar, seismics and some occasional guesses to work out where to dig with shovel or digger or to core the hidden sediments. It is not quite true that no stone was left unturned, but I have been amazed at how close we got to that, thanks to some amazing levels of energy and motivation; it is indeed lucky that our team displayed traits of obsessiveness and kleptomania when it came to sampling. Bloody well done to all. So our very last sample (core 179-VC) on BRITICE-CHRONO has now been collected, marking the end of Cruise Two on RRS James Cook. Even though we never got to shout ‘One hundred and …eighty’ it is more than we had planned. 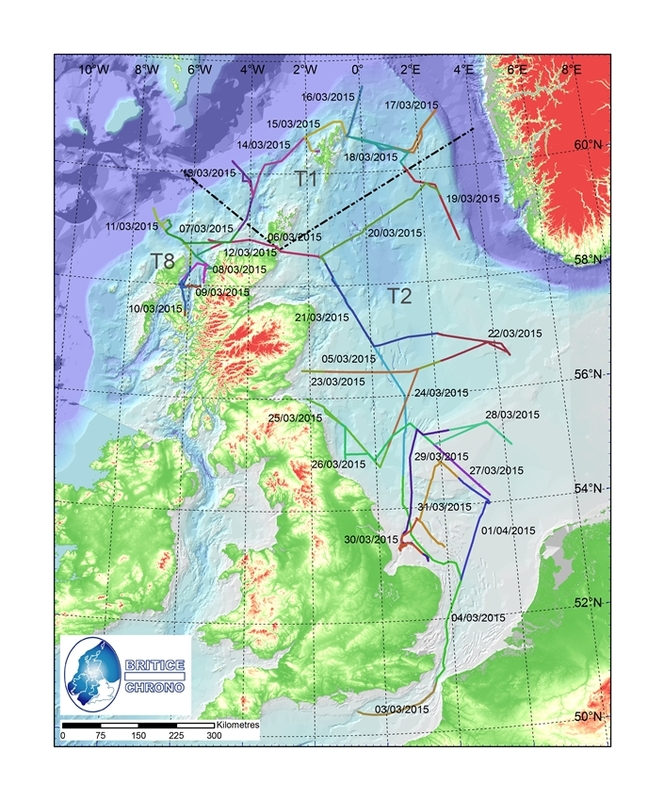 We have sailed, steamed, or dieseled 8971.65 kilometres, taking in Skye, Rona, Shetland, and more North Sea banks including (the infamous Dogger) that you could shake a stick at. We have sampled deep (525 m) and very shallow (19 m), and calm and troubled (force 7). Our ship-track might look erratic to some but, as they say in marketing non-speak, it comprises a subtle blend of caution and well-planned targets with a hint of adventure and wild abandon yielding a truly inspiring collection of mud and sand to sate the yearnings of the most inquisitive discerners of ice sheet curios. The haul, now sat in our refrigerated lorry-container and packed in plastic tubes was obtained by lowering our vibro- and piston corers through 18,891.4 metres of seawater and extracting over half a kilometre of sediment (Rich says 542.4 m). As well-known, of course, it is not the length that counts, but the quality. 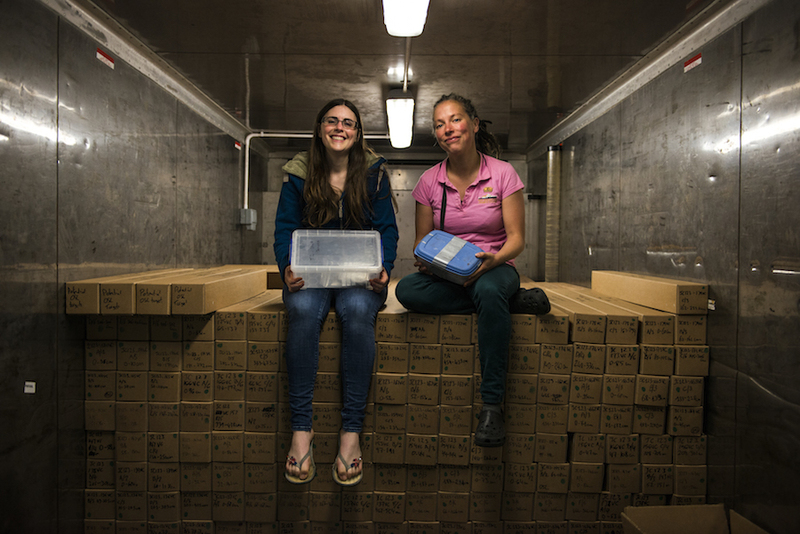 It will be some time however before we know which cores, places and transects yield the best shells and forams for dating, but Margot and Lou have already bagged, sifted and labelled the celebrity shells which we think have the best stories to tell….’well there was this bloomin’ huge great wall of ice that kept crashing down, and would you believe what happened next….’. 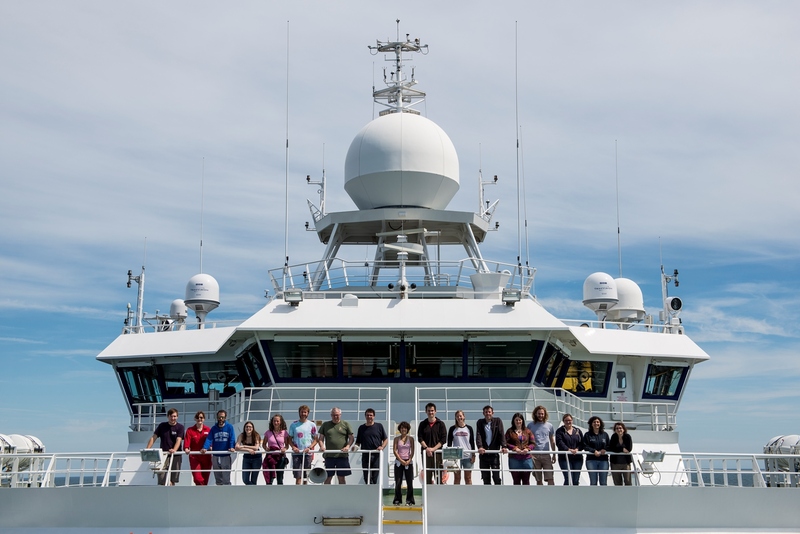 Thanks to Colm and his science team, the Captain and crew and the geological survey coring teams, and the weather, some good planning, crazy hunches and some luck, this scientific cruise has been a great and enjoyable success. We have a mammoth payload that we hope will provide a legacy of new information for decades. It has been a pleasure having Alex, the ever-present black ninja-photographer on-board, – he stalks, clicks and then runs – in his quest to document our highs, lows and silly moments. Hopefully you have already seen much of his work. We set out to do 50 years work in five. Taking this cruise with last year’s, which circumnavigated Ireland, along with our >300 person-days of terrestrial fieldwork we have bagged around 15 tonnes of samples for dating and I hope you agree that we have been around a bit. Sorry if we missed your patch, why don’t you have a go? It is an end of an era for our sampling effort. As project leader, I now breathe a large sigh of relief that it is over and has gone so well, phew and phew again. There is a tinge of sadness though, that we all feel as the fun, bonhomie and making of new friends on hard-won field exploits has now ended. No more pie shops or sneaky pints. Team Terrestrial (Rich and his gang) and Colm’s Marine Crew, can now stand-down to great applause. Derek’s Geochron Team have their work cut out to carefully analyse all the samples and then our Transect Leaders (Tom, Dave, Rich, James, Colm, and Sara) will rise to the challenge of making sense of it all and telling us the story that the shell started to blurt out. Chris Clark, signing off on behalf of BRITICE-CHRONO, currently steaming 11 knots, homeward bound, over the Tea Kettle Bank of the southern North Sea. All cores logged and packed and the pinging geophysics finally turned off. This entry was posted in Discussions of science, General chat, Geochronology specific issues, Marine geology specific issues, Terrestrial geology specific issues and tagged briticechrono, Cruise, fieldwork, geophysics, Marine, marine sampling, multibeam, RRS James Cook, T1 transect, Transect 8, Transect T2 on August 2, 2015 by briticechrono.